I feel very badly for all those who have died flying paragliders. I also hope that my own personal words or actions may have stopped someone from trying or continuing to fly paragliders. But paragliders kill more than simply the people hanging below them. How many more hang glider pilots would there be if paragliding ended or had never begun? So, paragliding has "killed" hang glider pilots as well. It has killed those who ended up never trying hang gliding (because of paragliding). It has also killed the aviation spirit in individuals who, thinking that paragliding is safer than hang gliding, quit flying PGs because of how truly dangerous they are, then never gave hang gliding a chance. Why? Because they have been told hang gliding is even worse. 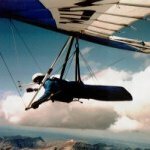 Paragliding has killed hang glider pilots - by killing paragliding participants who would otherwise have been fly the safer aircraft known as hang gliders. And those who promote paragliding are knowingly acting to kill the sport of hang gliding. To what purpose? To sell something that makes them more profit and is superficially easier to teach to the unknowing. The paragliding companies' best customer, . . . ? . . . the naive, the trusting, the impressionable, the innocent, the uninformed. Otherwise know as "children". No matter their age. So many hang glider pilots are feeding paragliding it is like a form of autosarcophagy. But I think hang gliding leadership, back in the early 1990s, (perhaps not realizing it ) invited a small group of the living dead (collapsible canopy occupants) into our association. Soon these living dead began to feed on us hang glider pilots and our organization. The condition of the 11-year-old boy from Bhowanipore — Vivyaan Ojha — who was injured while paragliding at Gangtok on Tuesday has improved. Though he was still admitted in the ICU, his father said that the boy was better. The commercial operator who was taking the child for a joyride for money was killed. At least the tandem operator won't be endangering any more children. And the young man has a story to tell about how dangerous paragliders are. I watched the above video and I think, . . . I have no worries about the canopy collapsing, and I have no worries about the tow rig creating complications. I see a young lady experiencing a wonderful flight on a hang glider. Of course, I still worry about a minor being injured or killed on a tandem ride on a hang glider (or under different circumstances, a PG). But this video demonstrates how things can work right out right. One thing I would mention is that I do not agree with doing (even mild) aerobatics with a tandem passenger on board. Which is done in the video. I've had a tandem rating and NEVER did mild or moderate aerobatics during tandem flights. The object is not to scare/thrill your passenger. The object is to teach them about how to operate a hang glider and to learn about the amazing features and opportunities that come along with the sport of hang gliding. That take off made me cringe, Mom.